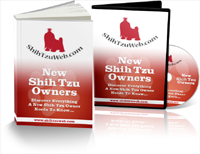 To get started, just fill out the form on the right to get your Free Info-Kit For New Shih Tzu Owners, which includes a special “New Shih Tzu Owner Cheat” as well as a special video on the #1 Mistake New Shih Tzu Owners Make When Caring For Their Shih Tzu. Please tell us what information you’re most interested in by filling out the form on the right. That way, we’ll be able to make sure the information we send to you is customized to your specific situation. Get started now!